Minister of Health, Dr. the Hon. 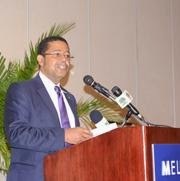 Perry Gomez said The Bahamas has put in place all of the necessary protocols and legislation to ensure that in order to practice Stem Cell medicine in The Bahamas, facilities where the therapy is actually practiced must meet standards of the highest quality in all aspects of professional best practices. Dr. Gomez said: "The technology, healthcare professional expertise, environmental infection control, medical record keeping must all be at the highest quality. "For example, the multi-million Cardiac Catheterization laboratory constructed by the Okyanos Heart Institute in Grand Bahama is the state-of-the-art and the most sophisticated 'Cath Lab' in the entire English-speaking Caribbean."